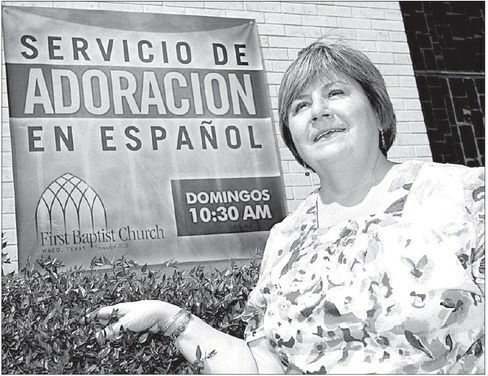 First Baptist Church of Waco is taking another step to reach out to its South Waco Spanishspeaking community by offering a Sunday service in Spanish. For years, the church offered its “Habla” Bible-study program, sports leagues and classes teaching English as a second language. “This is another opportunity to worship with and serve the people in our community,” said First Baptist Church Pastor Matt Snowden, noting the high percentage of Hispanics living near the facility’s location at 500 Webster Ave. While about 500 people attend regular services Sunday mornings in the church sanctuary, Spanish-speaking people wanting to worship will gather at a nearby chapel. 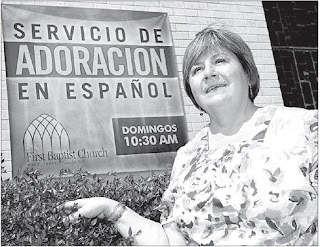 Delores Melendez, who oversees the activities ministry at First Baptist, said the church works hard to overcome doubts that people in the neighborhood may have about attending a large church founded in 1851. Melendez said First Baptist Church sponsors basketball and soccer teams that attract Spanish-speaking youngsters and other minorities. It charges a small fee for parents to sign their children up to play in leagues and provides coaches as well as pays to have officials supervise the games and buys T-shirts and other equipment youngsters may need. “Many of these children never played in a league because their families couldn’t afford it,” Melendez said. First Baptist is targeting these parents as it spreads the word about its new Sunday service in Spanish. “Some say their children are asking about God for the first time,” Melendez said. Jaime Cortez, 26, hails from Veracruz, Mexico, and attends George W. Truett Theological Seminary at Baylor University. He said he enjoys preaching to Spanish-speaking congregants at First Baptist. “There is need everywhere, but I see a huge need here,” said Cortez, who is married and has a 10-monthold child. “We have a lot of socialwork programs, and we have basketball leagues and soccer leagues that attract Spanish-speaking people. But there was nobody to share the Bible with them. He said he and others approached Snowden about starting a Sunday morning worship service. “He said, ‘If you want to go for it, go for it,’ ” Cortez said. Cortez received his bachelor’s degree in theology from the Baptist University of the Americas in San Antonio, where several professors urged him to pursue advanced degrees at Baylor’s Truett Seminary. Cortez hopes to serve as pastor of a church someday in either Mexico or the United States. “I don’t know where yet, wherever God leads me,” Cortez said. So far, attendance at the Spanish services, which began about a month ago, has been sparse. “We have started very small, but we have great hopes the ministry will continue to grow,” Snowden said.